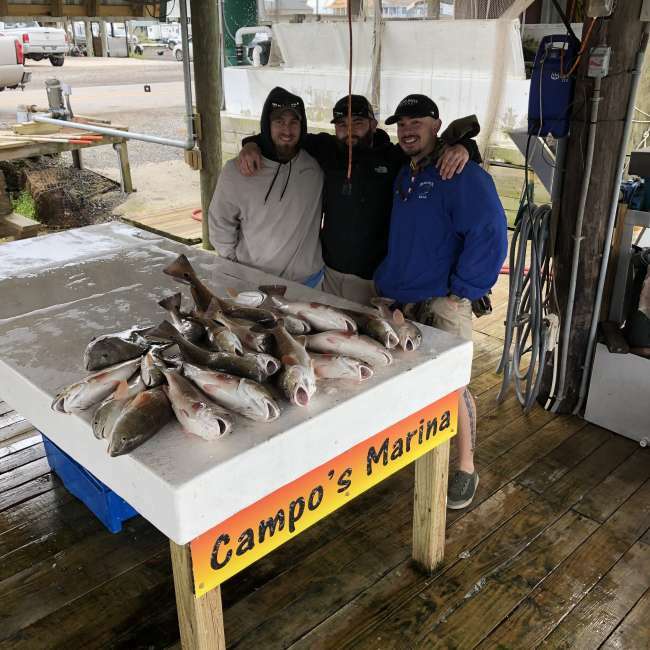 All fish in the Suzuki powered Blazer Bay 2400 were caught with Campo’s live shrimp on Capt. Rory's United Charters custom rods provided by CUI Products with Penn reels, spooled with Power Pro line. All fish removed and boxed with the one and only Just Grab it Glove. Windy Wednesday at Shell Beach. I picked up the Jim Walther and his quests David and Larry at Jim’s camp and off we went to find some trout though expectations were not high. The wind was blowing ridiculously hard out the ENE. We found some birds diving in a bayou and the guys put some trout in boat weeding through a lot of through back. 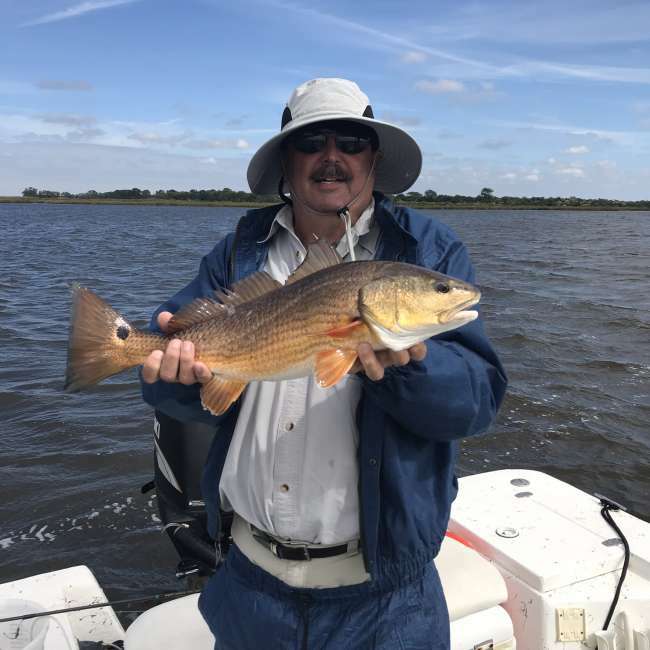 We moved further down the bayou and got on another trout bite till it faded with 40 or so in the box. Next we looked for some reds and plenty of them we found. 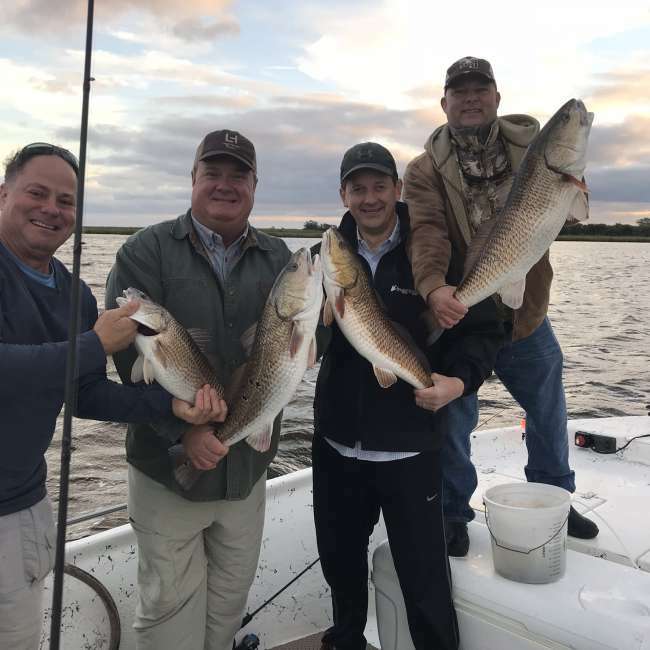 The guys had a great time filling the box with some pretty reds. Spooky specks at Shell Beach. 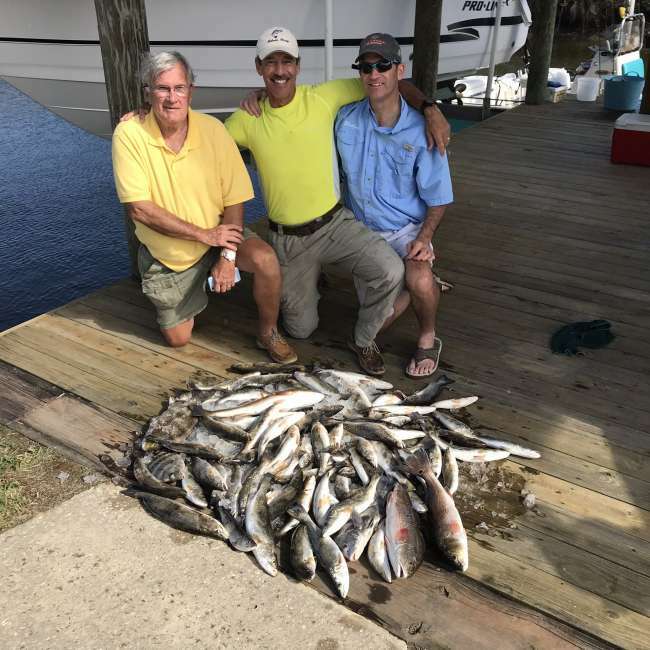 Yesterday I had Jim Walther and his two guests Clint and Clint on the Blazer Bay. The wind was howling when I picked them up at Jim’s camp and the tide was still rising though it should have been falling. We found some birds working in a pass between two lagoons and the guys went to work. The bite was not crazy fast, but was steady. 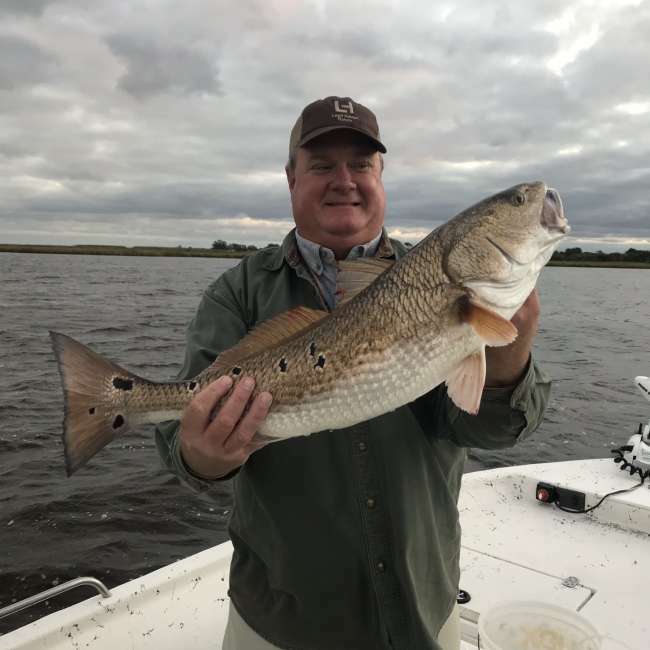 When the tide finally turned around our bite faded, but not before the guys limited out on trout and added a few reds to the box before calling it a day. Shell Beach meat haul. Yesterday I help Capt. Ed with a two boat trip for a group from Texas. With calm conditions we made the run out into the Sound. 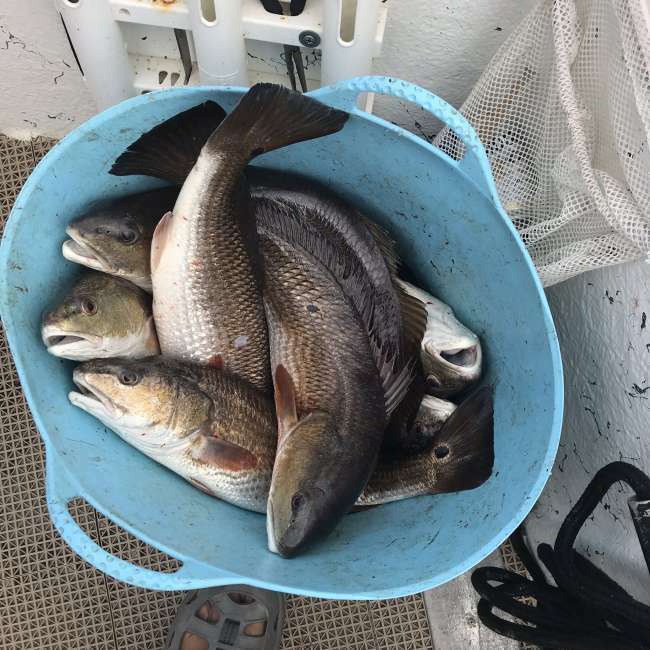 We hopped around a few wellheads and got on some good bites of big reds and lots of sheepshead. The guys crammed both boats ice chests to the top and had a blast doing so. Everyone limited out on big reds with a few smaller keepers and all the heads you could ever want. Another great day at the Beach. Girls beat the boys in Shell Beach. Saturday I ran a two boat trip with Capt. Gabe. 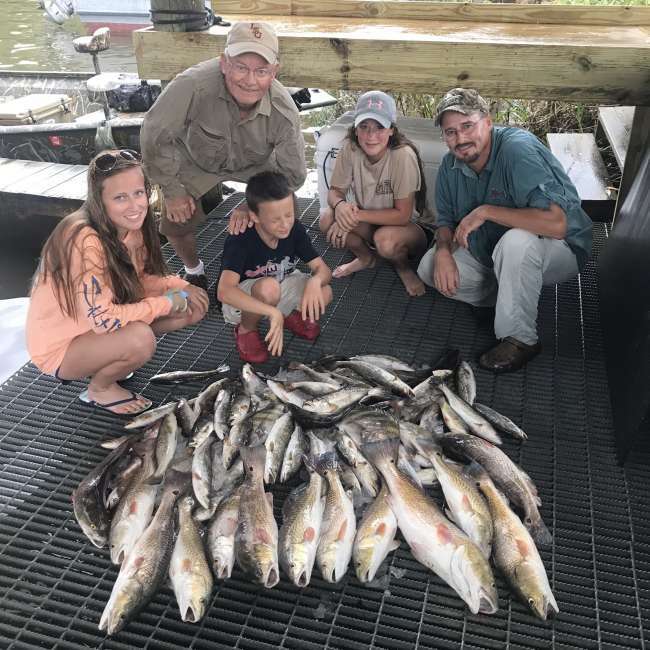 We had a group of 10 and the boys hopped on my boat and the girls with Capt. Gabe. It started off pretty calm but the winds were going to be picking up so opted to stay in the marsh and it was a good thing we did as the winds picked up as the morning went on. 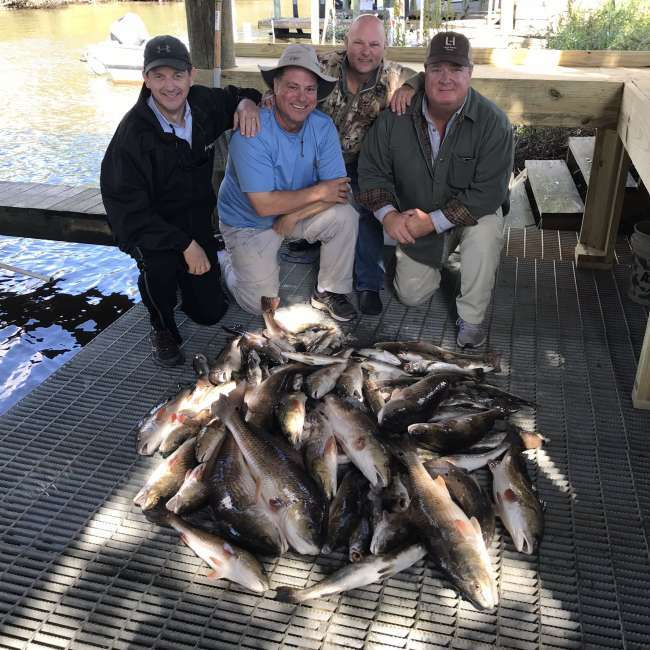 Fishing with Campo’s shrimp under 4 Horsemen corks my guys filled up the box with reds, a few bass, 3 flounder, and 1 lone trout. As good as they did the girls did better. They had some bigger fish and limited out before us, but everyone had a blast, except fo the fish. Not good a day for them. 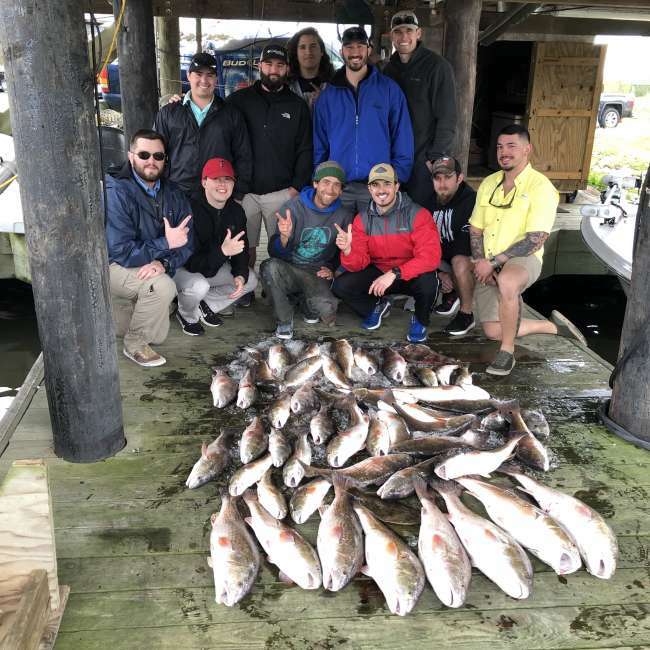 Bachelor party redfish beat down at Shell Beach. Last Friday I helped run part of a 3 boat trip for a group of guys from Texas in town for a bachelor party. Conditions were pretty nasty and there was rain on the way. We got lucky on the rain since it broke up passed around us, but we sure caught the wind. We got lucky on the redfish too. We made one stop and the spot was barely fishable. Good thing for us the reds were hungry and the corks were steadily going down. 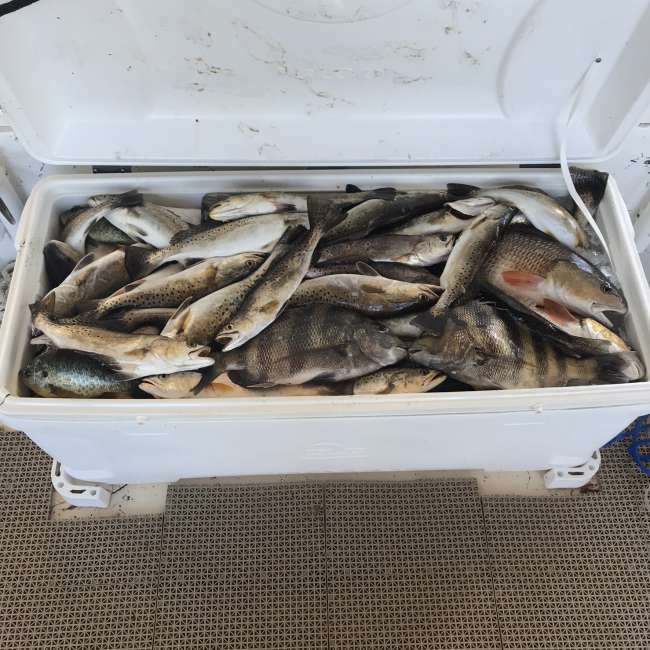 The guys had a blast filling up the fish box, and the other two boats did equally well. Spring is here and the fishing is heating up. Trout are starting to bit really well and the Bull Red and Sheepshead action at the rigs is flat out crazy. Book your spring and summer dates now while choice dates are still available. Call now to book your trip of a lifetime. Overnight accommodations on the bayou are available. I have this coming Friday and Saturday open. The weather and winds look good and the fishing has been great. Spring is here and the fishing is heating up. Trout are starting to bit really well and the Bull Red and Sheepshead action at the rigs is flat out crazy. Book your spring and summer dates now while choice dates are still available. Call now to book your trip of a lifetime. Overnight accommodations on the bayou are available.